There is strange limbo of a zone that is not quite like being either in or out of the zone. Many people can wallow in this place for years. When we sit in our Comfort Zone, we are both at peace with the world while also not challenging it, and perhaps experiencing it to the full. If we don’t stick our heads above the parapet, nobody can take a pop at us. If the Comfort Zone was a place, it would sit geographically between a Doing Zone and a Danger Zone. It is safe harbour and somewhere we can’t get hurt whilst also not truly shining our light. There is absolutely nothing wrong with this. Some choose to spend their whole lifetimes in the Comfort Zone. Why rock the boat? Why take risks? It something isn’t broken, why attempt to fix it? There is quite a close similarity between the Comfort Zone and a Being Zone. The difference though is subtle. When we spend too long in the Comfort Zone, we can atrophy. On an individual basis, stimulation and change promotes good mental and physical health which, in turn, fosters good health, well being and longevity. Collectively, the human spirit strives to know and achieve more in each generation. This means that it is natural that things have to change. When they do, we find we have to wander into new, uncharted territories. This is not about change for change’s sake. Many human activities have proven to have a negative impact on our health and environment. Our modern world has many faults but they are perhaps outweighed by our marvelous achievements, all of which have required some brave souls to step out of their Comfort Zone. The technology of war ironically has some surprising peace-time spin offs but many have lost their lives in the process of such ’advancement’. Many surgical techniques were first pioneered on the battlefield. The use of fossil fuels has given us mass transportation but at the expense of an altered environment. Our use of natural resources has brought, for many, an improvement in well being. It has also scarred the planet and many species have been decimated as a consequence. Many peoples have lost their natural homelands too. It’s clear then that stepping out of our Comfort Zone has to be done with care and diligence. What helps us take the right steps in the right direction is having purpose and high intent. It may be altruistic but it helps to take steps out of our Comfort Zone with the aim of helping others, and only ourselves in the process. When we move out of the zone and make our intentions clear, we will find support from those around us should we stumble. Any faux pas will only serve to strengthen our resolve and show us the right path should we wander down a blind alley. We may be entertaining others with our art or teaching others with our learnings and research. We may be inventing the next amazing life changing gadget. Without doing a survey, it is common sense that there are many more half-finished manuscripts than published books. There are many more patents that never made it off the drawing board than inventions in use in some form or other today. Many of us will sit back and let someone else carry to baton. There are over 7 billion of us and some people have a natural disposition to lead, to explore and to be change-makers. The explorations of the zones in this book are designed to help those who want to get out their armchairs and off their sofas to make something happen. 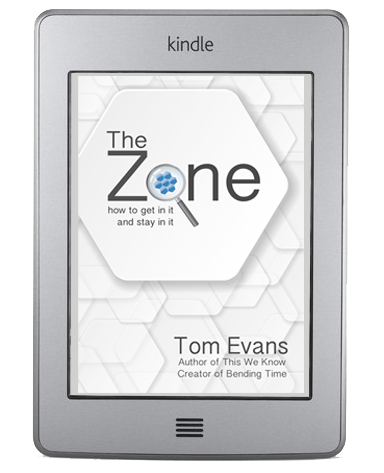 My new book, The Zone will introduces the qualities needed to escape your Comfort Zone by wandering into in a Doing Zone. By exploring the Danger Zones, the book gives strategies to help cope when the wheels come off the bus. The last section of the look explores the Being Zones. These are a place where we reach a new level of comfort. We find then a Comfort Zone that exceeds all our expectations. These are places where we make change by just being who we came into this world to be. The Zone is available for Kindle, Kindle readers, in print and as an audiobook with guided meditations.